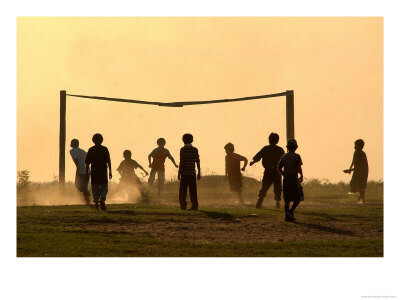 I still remember waking up my dad at 4 am to play my first inter-school match that was going to take place 10 minutes away from home. (Mind you, the scheduled time for the match was 8 am!). Fast forward to the game, we lost the game 4-0 with me scoring an own goal. But the fact that I got to don the school colours, playing in the league, imagining curling the football like a pro and being part of a soccer team, made me smile from ear to ear. Miss those days, really cherished those moments. Don’t see that passion these days with the kids. The other day I had gone to watch a short training session at my school. Grass pitch, those traffic cones, freshly painted goal posts, everything looked so rosy and nice. We never had this in our time, mucky ground, a spare pair of studs if you really needed one. These days ‘organised’ sports tournaments spend such a large amount of money on registrations that only the rich parents can afford to send their kids. Monetary value over talent takes place and there’s nothing that can be done. I approached a couple of NGOs to see the actual condition. One of them spoke of school’s donating food, sports apparels at the end of every season. Some of which don’t fit the lesser fortunate kids or are in such bad state. Picture this, the cost of your kid to play a sport or even learn one has now gone up by more than 100%. You have the enrolment charges, equipment charges, the right footwear, the travelling fees, the medical aid and meals for replenishment. The list can go on. On the other side of the story, are parents getting themselves too involved and competitive in the sport. It is one thing to provide your child with everything needed, but recently they try to give their child the edge, which creates a divide among the children and the team. If you want your child to be a success in life or in sports, let them find their feet based on their skill ONLY or acquire a liking to the sport. It is better to let them try and fail now, than giving them a false chance of success. Don’t let sport burn a whole in your pocket. Let your child have an enjoyable experience. He/she will learn greatly from it. Interesting read… The competition grows fiercer every year. Keeping this in mind, every parent will have to take a stand… The question is are they going to be convinced enough??? Excellent post about the prevailing apathy in sports. The problem indeed is at the grassroots level and winds viciously all the way to the top. Great effort on your part to actually do something about it by approaching NGOs. And aptly pointed out the swiftly diminishing passion in kids these days. Games are now becoming something to be fed to the kids rather than them embracing it themselves.